Submitted by KAT on Thu, 10/01/2009 - 6:15pm. You can tell fall's in full swing, all the signs are there: the chill in the air, the fiery foliage, the stores stocked with cheap plastic landfill-ready Halloween tchotchkes that are probably chock full of phthalates, bisphenol A, and who knows what other toxins. Not to mention the lead coated wires on all those light-up spider webs and skulls. And the swine flu's back with a vengeance; will medical masks outsell the usual disguises this Halloween? Scary stuff, indeed. But the start of the school year creates another frightening dilemma for many parents; how to fill your child's lunch box with something less horrifying than, say, a Kraft Lunchable? There are plenty of parents who'd rather send their kids off to school with a more wholesome, less processed lunch. And though we all think of October as the season for harvests and Halloween, it's also Vegetarian Awareness Month, which kicks off today with World Vegetarian Day. So now's the perfect time to get acquainted with Jennifer McCann, the veggie-loving blogger who began documenting the delicious and delightfully inventive plant-based lunches she created for her son on his "first day of school in 2005," as the New York Times recently reported. Thousands of parents desperate for a healthy alternative to the lamentable Lunchables began flocking to Vegan Lunch Box, McCann's website, and trying her recipes, launching her on a new career as a cookbook author. 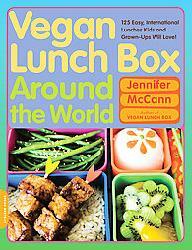 McCann's cookbooks, Vegan Lunch Box and her latest, Vegan Lunch Box Around the World, may be geared towards children, but they're perfect for anyone--kids or no kids--who enjoys simple, eclectic dishes featuring fresh takes on familiar foods. Her stated goal is "to inspire others to eat more healthy, plant-based meals and move more." I interviewed her recently via email to find out more about how this "bento blogger" became a publishing phenomenon. KT: How did you first become interested in making bento boxes for your family? JM: When my son started first grade. I had never packed lunches before, and at first I couldn’t come up with any vegan ideas beyond peanut butter and jelly. Then I asked my son what he wanted for his first day of school and he said “Sushi!” It opened up my eyes and I started thinking of all kinds of dishes I could pack. They looked so cute in his colorful lunch box, I started taking pictures and blogging and doing more things to make his lunches little works of art. KT: Did you ever imagine when you first began blogging about your son's lunches that your website would find such a wide audience? JM: Not at all! I thought there would be some other vegan moms looking for ideas for their kid’s lunch boxes, but I never imagined that it would grow so big so fast, with thousands of people checking in each day to see what my son had for lunch! JM: Oh, so many! I’m very partial the cooking of Mexico and Africa, especially West African and Ethiopian cuisine. KT: You've made a name for yourself with your creative, plant-based variations on classic comfort foods like chicken pot pies and corn dogs, as well as more wholesome versions of Twinkies and goldfish crackers. What was your toughest challenge in this category, and which adaptation's been your greatest success? JM: The toughest was definitely tuna. My son sat next to a boy who ate tuna fish sandwiches every week and he really wanted to have one. We tried store bought fake tuna but he didn’t like it. I finally came up with a good recipe for Chickpea Salad with vegan mayonnaise that makes a great sandwich filling and made him happy, but it’s not tuna. The greatest success would have to be Twinkies. They’re so much fun and everyone loves them! KT: You are a fearless promoter of such under-appreciated veggies as kohlrabi and kale. Is there any vegetable that you couldn't persuade your son to eat regardless of how entertainingly you presented it? JM: Absolutely, all kids have their own tastes. Some veggies, like onions and peppers, my son won’t try in any form. Others, like salad or kale, he’ll only eat occasionally or if I make it a certain way. KT: Your profile on your website suggests that you're an avid gardener. How much food gardening do you do? Was there anything you planted that wasn't worth the trouble, in retrospect? What's grown especially well for you? JM: I do like to garden! I have a large vegetable garden in my backyard. Tomatoes grow wonderfully here; I usually can enough tomatoes to last us the rest of the year. I also have great success with zucchini, melons, winter squash, okra, raspberries and strawberries. Brussels sprouts and broccoli have been a disaster -- they get buggy. KT: Have you ever contemplated working that McCann magic with breakfast or dinner? JM: Well, we often eat something for dinner and then feature it in a lunch the next day -- leftovers make great lunches! But breakfast almost never changes -- it’s always a smoothie made exactly the same way. I guess none of us are ready for an adventure first thing in the morning!